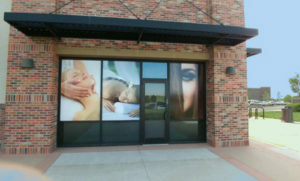 Window decals can transform the windows on your vehicle or retail storefront into dynamic message boards! With custom printed window decals it allows you to make the most out of the marketing real estate space that your store and vehicle windows offer. There are two basic ways to go about using window decals. If you are looking for something smaller, window clings are a great alternative to putting stickers on your window. If properly applied, they stick just as well as an adhesive-backed sticker. The advantage is that they come off clean, leaving your window residue-free. Take full advantage of all of your available window space with perforated vinyl or vinyl cut letters. These can be cut to take up the entire window if you desire. When perforated vinyl is applied to glass with a design one side, it allows visibility from within, while appearing to be painted over from the outside. You may have seen this technology in use by local businesses; it is particularly popular on buses. Not only does this allow for more expansive design options, it can also serve as a theft deterrent. Perhaps you operate a mobile business where valuable tools and equipment may visible be in the back of your vehicle when you are parked at a job site. 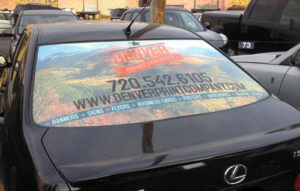 Window graphics will prevent visibility into your vehicle while still allowing in natural light. For a retail store, this easy to apply and remove vinyl is a fast and cost-effective way to transform your windows for different sales, promotions, and events. Denver Print Company has helped countless small businesses realize the potential with great looking professionally designed window decals quick and easy. If you own a small business that has large or medium sized windows that customers see when walking in, you could be missing out on tons of promotional opportunities. This type of marketing is great for Salons, gyms, bakeries, real estate agents, barber shops, restaurants, bars and nightclubs and any small retail location. Custom printed decals are a more cost efficient replacement compared to the classic window painting, a practice that has been in use for decades. Make sure you are taking advantage of every inch of marketing space available to your small business by using custom window decals. Not sure if you have the right file for the vehicle decals you need? Our experts will review the files and send digital proofs that outline any problem areas. If you need the file re-created our team would be happy to help red-design or start from scratch. Request a graphic design quote. Let our experts install your window graphics for you! Our professional installation takes away the headache of trying to get it perfect yourself.